Oil guideFind the right oil for your vehicle. One engine oil for all the heavy vehicles in your fleet, is that possible? 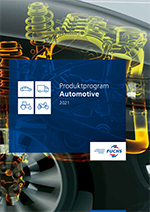 Our product program for automotive, in Danish. Statoil product to FUCHS product.